It was calm. Going south to go up the back shore and over the top of Cape Ann before the predicted southeast wind picked up was a smart move. The anchoring looked good to me just at the mouth of Loblolly Cove. Pete and Jacquie took off quickly to try out her new wetsuit and look for lobsters. Paul B. and Richard B. were also hunting. Jim C. and Laurent D. were exploring and hunting, respectively. Bill L. was planning for an hour’s bottom time with his digital camera. The Captain said he could see the length of Easy Diver’s water line on the surface – that’s 30 feet, plus. On the bottom, Pete said they could see about 16 feet. The water was 58 degrees. Several of the divers said they saw the cables that formerly powered the twin lights of Thacher’s Island to the east. Over the years, when a cable has failed, it’s just been abandoned in place and a new one layed down. The island is now solar-powered. As the dive wore on, the wind freshened and waves built as they came around Lands End point. The sky started to cloud over more thickly. We were glad to move to more shelter for the second dive. I picked Straitsmouth Island’s north side. As we rode through the cut and turned right, I saw only one fisherman near our projected dive site. The calm water in the lee of the island looked very inviting. We set anchor to the left of the big rock in the middle of the cove. 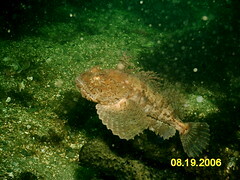 Pete said he and Jacquie saw a flounder. They’ve been missing during the last few dives. Visibility was about 8 feet. Laurent said the thermocline at 23 feet was where the visibility got really bad. Hunting was good however. In addition, Pete said there were oversized, egg-bearing females everywhere. 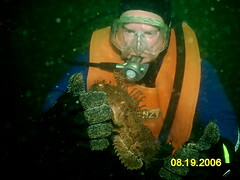 Bill saw a little lobster eating the legs off a sea star. As the dive progressed, four new fishing boats came up to anchor on either side of us. I was glad to leave and make the smoothest return home possible down the western shore of Cape Ann to the Annisquam River and home just as the rain started. A cheeseburger at The Gull made the rain less chilling. It was easy to choose to go south. The breeze was from the northeast and the tide was low enough to get through the Blynman Bridge without an opening. We stopped at Brown’s for diesel and then made our way down to Manchester. I wanted to find somewhere new and picked the lee side of Egg Rock. Swells from the southeast made many places bumpy for anyone who stayed on board while others dived. Today that would be Pat Walsh and Kathy Cardinale. Pete and Laurent got lobster, but not lots of them. Vibility in 25 feet had been about 15 feet. We motored over to an island containing a single house that Kathy, Pat, and I wanted to get a closer look at. Called Crow Island, it has a black wrought iron fence all the way around the compound. It is between Black and White Beaches. We anchored just off its coast in 25 feet of water. The swells were manageable here and the water was still very warm. I jumped back in with the remainder of my tank from the first dive. I swam slowly into the shelter of the White Beach cove and the visibility improved to about 20 feet. Back outside the island, I saw periwinkles covered in pink coraline algae. They were lined up along a piece of kelp and were dining as though they were at a breakfast bar. Pete saw lots of little fish fry on every rock. He even saw them try to stay aligned with a piece of kelp when he moved it. They moved too. There were just a few legal lobsters here. We pulled anchor and motored back to Gloucester Harbor and a HUGE strawberry shortcake at The Gull. It was a much better day than had been predicted. We traveled north this time. The best site seemed to be beside Smiling Fish Cove, a.k.a. Rowe’s Cove in Rockport, in about 25 feet. Bill Low was in first because he wanted to made a 90 minute dive. Then Larry, Bill and Cathy Myers, and Steve Gates suited up. Steve brought his video camera and Cathy carried her digital one. The Captain and Steve worked through some close ups. The water was 52 degrees at 35 feet, according to Larry, although the visibility was only about 10 feet. Legal lobsters were absent. Pat and Pete were crew. As the breeze freshened, we decided to seek a more sheltered position for the second dive. I could see across Sandy Bay that the far shore seemed calm. We aimed for somewhere between Old Garden Beach and Gully Point. Wouldn’t you know it? We found that Billy’s Belt was the best place. It was about 35 feet deep there and the boat didn’t rock very much at all. The day ended with a leisurely drive back over the top of Cape Ann where we saw a party boat from Hampton, NH, called White Star anchored and day-fishing off Emerson Point. We all recognized the boat’s name as the same as the company that owned the Titanic. Not an especially auspicious name for a boat. 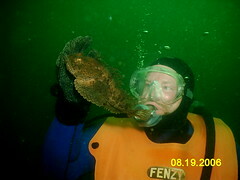 Here is a short video clip of a sick or eaten orange sheath tunicate. Here’s a little snippet of unedited video that I took while holding my breath. His digital camera is very versatile. Another bee-yoo-tee-full day in Glawsta – high 70s, lots of sun, and a breeze from the northwest. We decide to go south and glide under the Blynman Bridge with a super low tide. The trip includes two non-divers: Trisha and Cat. They are with Jim Castelli and Laurent Dubois, respectively. Also with us are Bill Low and Joe Finkhouse. Crew is Veronica Atlantis, Pat and Pete. The second site was just around the corner on the way back towards Norman’s Woe rock. We moved because the wind had shifted more westerly and we were being bounced. The two non-divers didn’t need to suffer that and we wanted to see somewhere different anyway. I don’t remember ever having anchored here before. We were right below a mansion’s pool that had a stone wall surrounding it with a stone pool house and a statue of a woman with her hands up behind her head. The water was still in the upper sixties on the surface, with the bottom about 60 degrees. It was a tad bit shallower here, but still 10 feet of visibility. The air warmed some and the clouds multiplied, but the day was still wonderful…for September. Summer can’t be ending already. It’s breezy from the northwest, with a super low tide as we load up. Kevin and Linsley Mordasky, Pat and Karen Hatcher with Bethany and Bob Brousseau are the customers. Pat and Pete are crew. The Captain and I had breakfast overlooking Gray Beach in Magnolia where we decided to go south because it looked so good. The first anchorage was in the lee of the wind. It was on the southeast corner of Graves Island, in about 30 feet of water. Linsley and Kevin said the surface water was 68 degrees. Peter said it was 58 on the bottom with the tide rushing in. 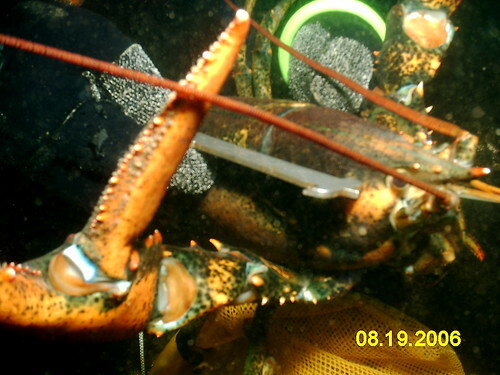 There was a school of pollack and lots of little lobsters. The visibility was about 10 feet. 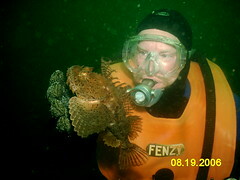 We met Arnie and Glen who were anchored closer to the Wreck of the New Hampshire on Arnie’s boat, Rapture of the Deep. The second spot was on the eastern edge of Kettle Island, in about 25 feet. It was warm and had lots of boulders and crevasses, but much kelp too. Visibility was again about 10 feet. We saw a school of feeding fish from the surface as we anchored. 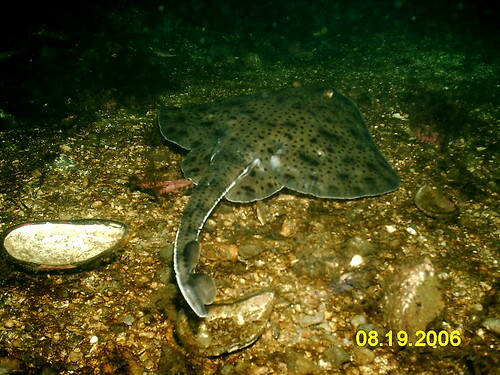 Underwater, we identified them as pollack. The lobstering was good here. We had lots of laughs and a hamburger at The Gull to top it off. The new mapping software that is available for free is awesome. Here’s the Deep Wall at Kettle Island, Manchester, MA. Bill was with us last weekend. His digital camera takes short sequences of video. One of his videos is already linked to that trip report below. stripers looking for a meal. Watch one examine an empty shell to see if there’s anything to eat in it.